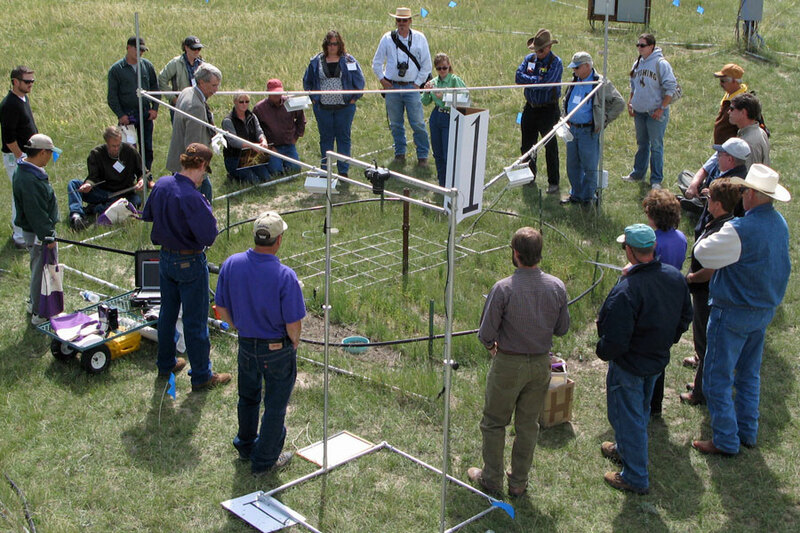 The PHACE project, a large collaborative effort between the University of Wyoming, USDA ARS in Fort Collins, and Colorado State University, is a long term effort to quantify how a semi-arid grassland in northeastern Wyoming are responding to a combination of global change factors. The group is interested at looking above and belowground and linking responses with mechanisms in order to better model future responses of this and other similar ecosystems to climate change. My work focuses on how plant community structure and function respond to climate change and linking those responses to biogeochemical processes. Our recent paper in PNAS describes the results of the 8-year study that tracked plant community stability under simulated climate change conditions. Recently, I have also started thinking about what stable isotope analyses can tell us about how plants in the PHACE experiment are faring, with the goal of linking physiological and ecological responses. Final plant biomass harvest in July 2013 at the PHACE site, High Plains Grassland, USDA - with David Augustine, a USDA ARS researcher and collaborator on the PHACE project. Bromus tectorum (cheatgrass) has successfully invaded plant communities across the western U.S., across a range of climatic conditions and ecosystems, including cold desert shrublands. The success of this invader may be the result of its phenotypic plasticity and adaptive genetic variation. I am interested in assessing the potential of eco-evolutionary B. tectorum responses to climate change and how these eco-evolutionary responses shape future B. tectorum distributions. After 5 years under experimental warming, B. tectorum shifted phenology, with impacts on growth and reproduction, and this was especially evident in wet years. Moreover, there is some evidence of selection under experimental warming, with a reduction in genotypic diversity and potential selection for adapted genotypes (Zelikova et al. 2013). This work is serving as a platform to ask broader questions about how evolutionary responses (adaptation) to climate change may influence future species distributions. To begin addressing this question, I am working with researchers from the University of Florida, Colorado State University, University of Nevada Reno, and USGS and Forest Service scientists, linking field experiments with characterizations of the fundamental niche across B. tectorum's western invaded range and incorporating experimental evidence into a predictive modeling framework.